I watch a lot of garbage movies, and that sometimes involves watching movies about garbage, especially movies about monsters that come from garbage. There may be more of those than you think. Godzilla vs. the Smog Monster comes to mind right away, as does the fantastic Slithis, which boasts one of the best monster suits of the Seventies. But I have never seen anything quite like The Milpitas Monster, a project that took three years to complete. The whole thing was written, directed by and stars high school students. Yep, this is a class project gone mad, and that may be what makes the whole thing so incredibly endearing. Milpitas, California, is full of trash. Even after expanding the city dump, they just don’t have enough room for all the refuse the town creates. The whole place is a bubbling pile of waste, to the point where creeks have been turned into fenced-off areas known as sludge lagoons. Why anyone would go fishing in a sludge lagoon, but that’s how we meet one of the recurring characters of the film, Stew George, the Otis-like suit-wearing town drunk. He bumbles throughout the length and breadth of the movie, the closest thing to an Everyman the movie provides. In Milpitas proper, things are getting ugly. The citizens are upset because someone keeps stealing their garbage cans, sometimes scattering the contents all over their lawns. The fact there are giant footprints at the scenes of the waste receptacle thievery is less important to the townspeople than the loss of their personal property. It gets to the point where irate groups of homeowners storm a city council meeting with handmade signs, chanting “We want our garbage cans!” Really, folks, can you not just buy a couple replacements? Meanwhile, local scientists are concerned about the rising pollution levels. The bay is filled with dead fish. There are high levels of hydrogen sulfite in water samples. While doing a water quality test, a lab tech recoils from the stench of the sample and watches as it sparks like it’s about to catch on fire. Milpitas is a dirty, dirty town. There isn’t a main character in The Milpitas Monster. We follow different people about. Stew George, a couple of high school students having relationship troubles, a group of juvenile delinquents in their souped-up car, politicians and news reporters all appear sporadically throughout the film. It’s an interesting kind of cinema verité form of storytelling, especially for a monster movie. And let’s talk about that monster, shall we? For it is every kind of low-budget awesome. Fifty feet tall, with glowing multi-faceted eyes and wings that seem to be made of cellophane, this thing flies around and has gigantic lizard claws. It’s a scrabblepatch creature, presented in stop-motion, traditional animation, and the standard guy-in-a-rubber-suit fashion. The creature design is crazy, like the Mothman after a telepod accident with a Sleestak, which is something you would expect high school students to come up with. Even when the monster swoops into town and destroys the Kozy Kitchen restaurant, the miniature work is amazing. It looks far more believable than the Hoover Dam breaking in Superman: The Movie. 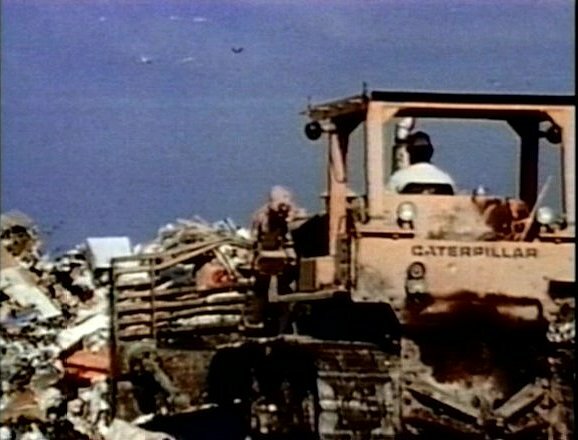 Director Robert L. Burrill, who was a photography and commercial art teacher at Samuel Ayer High in Milpitas, employs a lot of in-camera effects and forced perspective to make the monster look enormous and threatening. There was no such thing as CGI in 1976, except maybe Pong. The creativity and technical expertise employed in the creature effects is inspiring. I believe the children are the future. Teach them well and let them make monster movies. Working with a budget of only $11,000 and unbridled imagination, Burrill and his crew of high school students pulled off a minor miracle. It doesn’t all make sense, and they may not have had a sense of how local government really works (the city council pulls together an emergency task force about the missing garbage cans), but the creature design is stellar, the narrative structure is fascinating, and, frankly, I have seen movies that cost millions of dollars that didn’t have the heart or the sense of fun that The Milpitas Monster has. 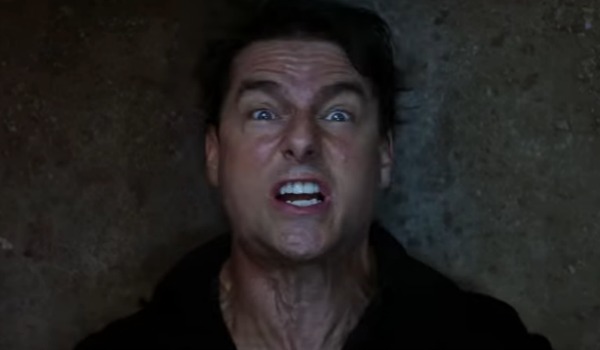 I’m looking directly at you without blinking, Tom Cruise in The Mummy. Look, this isn’t Citizen Kane or Eraserhead. It’s a monster movie, and they are admittedly a dime a dozen. But for a super low budget flick made by high schoolers, this is an impressive product. The Milpitas Monster is going to be one of those films that I encourage drunk friends to watch. And when they pass out on the floor, I will continue to watch the movie not only because I deserve to have this kind of goodness in my life, but because I can drink most of my friends under the table, like a male Marion Ravenwood. 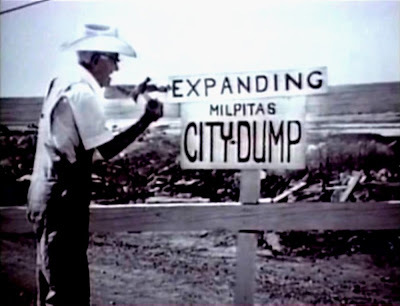 One man’s trash is another man’s treasure, and for me, The Milpitas Monster is something to be appreciated and cherished. The Milpitas Monster is lurking on the digital sludge lagoon known as Prime Video, and it is worth dredging through the muck to find.